Does suspension impact student achievement and dropout rates? States, J., Detrich, R. & Keyworth, R. (2015). 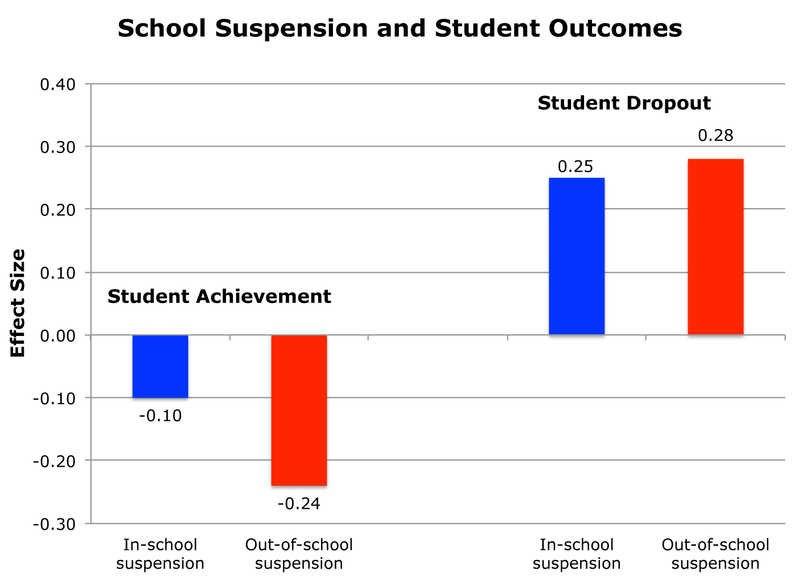 School Suspension and Student Outcomes. Oakland, CA: The Wing Institute. https://www.winginstitute.org/does-suspension-impact-student. Why is this question important? Student suspensions are an intervention frequently used in schools to control student behavior. During the 2011–2012 school year in the United States, 3.5 million students were disciplined by in-school suspension and 3.45 million by out-of-school suspension (U.S. Department of Education Office for Civil Rights, 2014). These statistics are especially troubling because African American and economically disadvantaged students are overrepresented in school suspension data (Christle, Nelson, & Jolivette, 2004; Shirley & Cornell, 2011; Skiba et al., 2011; Sullivan, Klingbeil, & Van Norman, 2013). The most common rationale for suspending students is to deter students from future infractions of school conduct rules. Unfortunately, many students find school far more aversive than the punishment. With our knowledge of human behavior, this suggests that suspensions may in other ways negatively impact the very students who are at the greatest risk for failure in our schools, increasing the frequency of suspension and the number of students who drop out of the system. This data mining piece seeks to answer the following question: Does suspension produce significant unintended consequences that harm the students it was intended to help? Result(s): A meta-analysis conducted by Noltemeyer, Ward, and Mcloughlin (2015) shows a negative relationship between suspensions and student performance on achievement tests. A slight negative effect size (ES) of -0.10 was associated with student achievement for those punished with in-school suspensions, and a more meaningful -0.24 ES for students receiving out-of school suspensions. These are small but possibly consequential effect sizes for both forms of suspension on student academic performance. When the researchers examined the impact of suspension in relation to student conduct, they found a significant association between both forms of suspension and increases in student dropout rates. In-school suspension was associated with a 0.25 ES increase in the student dropout rate and out-of-school suspension with a slightly larger 0.28 ES increase. This study, importantly, adds to our knowledge base by quantifying the overall strength of the relationship between the two commonly used forms of suspension and key educational outcomes across a diversity of school settings and student populations. Implication(s): Although the Noltemeyer et al. meta-analysis cannot be considered the definitive answer on the effects of suspension as an educational tool, the techniques reviewed in the paper offer evidence for reconsidering suspension as a means for solving student conduct problems. Further research into these issues needs to be conducted, but in the meantime administrators should consider redesigning their schools' policies and practices in accordance with the evidence found in this meta-analysis. Educators currently have viable evidence-based conduct training and disciplinary options that are not associated with negative impacts on achievement and dropout rates. An example of a well-researched alternative is Positive Behavior Intervention Supports (PBIS), a school-wide framework designed to enhance academic and social behavior outcomes for all students by emphasizing the use of data for informing decisions about the selection, sustainable implementation, and progress monitoring of evidence-based behavioral practices (Curtis, Van Horne, Robertson, & Karvonen, 2010). The study documented the relationship between school suspension (in-school or out-of-school) and at least one of the outcome variables (achievement testing and dropout). The study reported at least one quantitative measure of suspension rate (in-school or out-of-school) and at least one quantitative measure of one of the outcome variables. Participants were between pre-school and grade 12. The research design allowed for a measure of association between variables. The study was in English. The study was conducted since 1970. The study was from a refereed journal or dissertation. Of the 53 cases, 42 met the criterias for looking at the relationship between suspension and achievement, and the remaining 11 were acceptable for investigating the relationship between suspension and school completion. The cases included more than 7,000 participants from over 100 schools. The mean student age was 13 years, and the mean student grade was eighth grade. In-school suspension: Instances in which a child is temporarily removed from his or her regular classroom(s) for at least half a day but remains under the direct supervision of school personnel. Out-of-school suspension: For students with disabilities (IDEA): Out-of-school suspension is an instance in which a child is temporarily removed from his/her regular school for disciplinary purposes to another setting (e.g., home, behavior center). For students without disabilities: Out-of-school suspension means excluding a student from school for disciplinary reasons for one school day or longer. This does not include students who served their suspension in the school. Christle, C. A., Nelson, C. M., & Jolivette, K. (2004). School characteristics related to the use of suspension. Education and Treatment of Children, 27(4), 509–526. Curtis, R., Van Horne, J., Robertson, P., & Karvonen, M. (2010). Outcomes of a school-wide positive behavior support program. Professional School Counseling, 13(3), 159–164. * Noltemeyer, A. L., Ward, R. M., & Mcloughlin, C. (2015). Relationship between school suspension and student outcomes: A meta-analysis. School Psychology Review, 44(2), 224–240. Shirley, E. L. M., & Cornell, D. G. (2011). The contribution of student perceptions of school climate to understanding the disproportionate punishment of African American students in a middle school. School Psychology International, 33(2), 115–134. Skiba, R. J., Horner, R. H., Chung, C. G., Rausch, M. K., May, S. L., & Tobin, T. (2011). Race is not neutral: A national investigation of African American and Latino disproportionality in school discipline. School Psychology Review, 40(1), 85–107. Sullivan, A. L., Klingbeil, D., & Van Norman, E. (2013). Beyond behavior: Multilevel analysis of the influence of sociodemographics and school characteristics on students' risk of suspension. School Psychology Review, 47, 99–114. U.S. Department of Education Office for Civil Rights. (2014, March). Civil rights data collection: Data snapshot: School discipline. Issue brief no. 1. Retrieved from http://ocrdata.ed.gov/Downloads/CRDC-School-Discipline-Snapshot.pdf. * Study from which this data mining piece and graph data were derived.